This weekend saw the annual San Fermin festival at Pamplona in northern Spain. The festival is known for an annual bull run in which thousands of runners sprint through the streets of the Spanish city ahead of a small pack of fighting bulls. Injuries occur each year. This year one runner was gored in the leg and four more injuries were reported as runners, dressed traditional in white with red kerchiefs tried to outrun six bulls. The gored runner was taken to hospital for treatment, while the others were attended to by the Red Cross after suffering cuts and bruises. The run takes place in the early morning, when the streets are still slippery with dew, and sees the runners falling over each other as they race towards the city's bull ring. There could have been a much worse story for one young runner, who found his shirt caught on a horn mere inches from his face. Although he was dragged along the ground, he got back up and continued to run. The festival at San Fermin gained global fame following the publication of Ernest Hemingway's novel Fiesta: The Sun Also Rises in 1926. After the run there are all-night parties in the city in commemoration of its patron saint. One runner was a 27-year-old student from Los Angeles, Mark Martinez, who came to the festival while on a 10-day holiday in Spain. He described the run as "the best experience I've had". 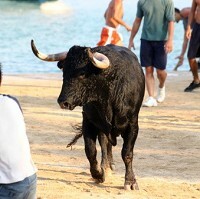 Of course, any tourist considering running with bulls should ensure that they are covered by travel insurance for such a dangerous activity.